"Yasser, like someone looking for some peace in this world". Our steps are barely perceptible on the cobbles as we cross the wide, empty central square of Svilengrad, bathed in the light of the warm September afternoon, a few kilometers from the borders with Turkey and Greece. "The first time I came to Bulgaria, in 2008, I took part in a folk festival in Pernik. It was great. I would like to live here, I said to myself then. I did not know that I would be back here to escape from a nightmare, only to end up in this impasse". Yasser is a Palestinian from Syria, 31, a professional dancer. He used to live in a village around Damascus. He ran away when he saw his friends killed by snipers in the streets. First he fled to Turkey, then to Bulgaria, paying like everyone else 600 dollars to the trafficker who showed him the way through the bush. "They caught me, beat me, and put me in the Lyubimets camp, Bulgaria. They call it a 'closed center', but it is a prison. There you are not allowed to have a mobile phone with a camera, they do not want the world to see in which conditions they hold who is in there – whose only fault is the desire to save their own skin". "For Syria, it is over. There will be no more Syria". Agir, 19, speaks calmly, but with an incontrovertible tone. He arrived in Bulgaria with the whole family – father, mother, and six siblings. He is a Kurd from ar Qamishli, in northeastern Syria, at a stone's throw from the Turkish border. "In the town all of us are Kurds", he says several times. He studied acting in Aleppo, then took shelter for a year in Erbil, Iraqi Kurdistan, where he managed a commercial enterprise. "But even there, Syrian Kurds are not welcome". "If Assad's army gets you, they shoot you just because you are Kurdish. But if you do not want to fight against the regime, then maybe they'll kill you because they consider you a traitor. We can no longer live in Syria: who knows if and when we will ever be able to go back". In Qamishli, Agir's family left home and three stores, “larger than a supermarket". "My father", says Agir, "never stops sighing. My mother never stops crying". "My wife died in an air raid, in front of my eyes. Even my grandson, who bore my name, was shot. He was seven years old. Of him, only shreds were found". Yahya, 73, is from Aleppo. He is missing his left arm, but I do not dare ask him if he lost it during the conflict. He has three children who have lived in Sweden for years. One of them returned to Syria to take him out. He drove to ar Raqqah, in northern Syria, and from there he managed to get to Bulgaria after passing through Turkey. At the Turkish-Bulgarian border, however, he was stopped: he had no papers. Yahya had to spend sixteen days in the Lyubimets "closed center" too. Now he waits for Bulgarian authorities to decide whether or not to grant him refugee status. Only then he will be able to resume his journey and reach Sweden, where his children are waiting for him. However, there is no procedure or timing for answering the asylum application. "I'm alone, I'm old, I'm a foreigner. All I can do is wait". Since the beginning of the Syrian crisis, Bulgaria has seen the number of refugees and asylum seekers increase exponentially. They all arrive after transiting in Turkey. All, or almost all, see Bulgaria just as a passage to reach the countries of central and northern Europe. Many, like Yahya, have relatives and friends who are waiting for them, but cannot reach them, at least until they come out of the legal limbo in which they are locked. In recent months, according to official data, the numbers sharply increased, so much that the government in Sofia fears a real wave, difficult to manage with the limited resources of the country, now guarding the south-eastern border of the European Union. "If in the past months we registered 400 arrivals per month, in August we touched 1,500", said a few days ago Deputy Interior Minister Vasil Marinov. "Since the beginning of September, there have been already 550". Every day the border police stops dozens of people and, according to the Bulgarian authorities, the limited reception facilities in the country are already exhausted. In case of further military escalation, however, the worst may be yet to come. The Ministry of Defence announced its decision to provide 26 sites in disuse, which may provide a temporary roof to at least 10 thousand people. In case of real need, however, using the facilities will not be easy. "A lot of those buildings are in very bad conditions", said Angel Naydenov from the ministry, adding that "the accommodation of refugees could take place only after consultations with other ministries, the municipalities concerned, and the local population". Concerned by extremely costly scenarios in human, political, and economic terms, Sofia has toyed with the idea of sealing its borders, an idea then abandoned because both in contrast with international commitments (such as the Geneva Convention on Refugees) and hardly applicable on the ground. At the same time, Bulgaria looks to Brussels for help. "We have little experience in managing this type of emergency, but we will receive technical support from the EU structures that deal with accommodating refugees", told the media Bulgarian Interior Minister Tsvetlin Yovchev. "There is a possibility that Bulgaria can also receive direct funding to address current challenges", added the minister, who has talked these days with both EU Home Affairs Commissioner Cecilia Malmström and International Cooperation and humanitarian aid Commissioner Kristalina Georgieva. On September 11th, as an emergency, the government agreed to provide 350 new places for incoming refugees. "In a short time", said Yovchev, "I am sure that we can say we have put the situation under control". Viewed from the Pastrogor "transit center", however, the confidence flaunted by the Minister seems rushed. We are four miles north of Svilengrad, not far from the borders with Greece and Turkey. 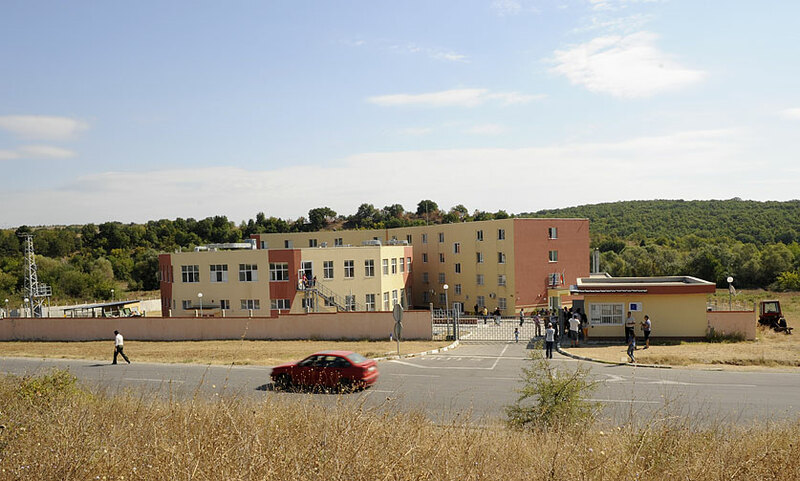 The opening of the center, accompanied by various scandals over the management of (local and European) funds, took place in May 2012, to accommodate people waiting for their refugee status to be ascertained. Here today are living Yasser, Agir, and many others. The center has an official capacity of 300 places, but at the moment, we are told confidentially by security officers at the gate (we have not received permission to enter, despite the request to the Agency for Refugees), in Pastrogor there are over 500 people, including about 150 children. At least 90% arrive from Syria. "There are no more beds, they make us sleep on mattresses laid on the ground", says young Mohamed, who arrived here a few weeks ago after escaping from Aleppo. "At most we roll out blankets to have a little privacy, but there are rooms in which five families live together". Just a year after the opening, according both to security officers and to people forced to live there, the center is in a pitiful state. The bathrooms, complain the women we meet just outside the center, are literally unusable, and moments of tension when newcomers are placed in already overcrowded premises are not rare, so much so that in July Pastrogor was at the center of a symbolic revolt, staged to attract the attention of Bulgarian society and institutions on the conditions of those who live there. Each of Pastrogor's "guests" receives 65 lever (about 30 Euro) per month for their livelihood. In the structure there is a canteen that does not work, a shop that charges too much according to asylum seekers, and a doctor all complain about. For those with small children, and they are many, the situation is dramatic. Buying milk powder and diapers is just as necessary as it is difficult. Pastrogor is an "open regime" center, which means everyone can walk out freely. Where, though? The nearby village has only 130 inhabitants, almost all pensioners. A tavern and a grocery store. Nothing more. Here some boys and men sit around a plastic table and watch the news on al- Arabiya. They are Syrian Arabs, Kurds, Palestinians of Syria. "In Syria we lived well, we had everything", sighs Mohamed. "See? Here are men and women of all ethnic groups in the country, and among us there is no problem. In Syria we are all one big family". Mohamed looks at the smoke rising in spirals from the cigarette held between his fingers. "I do not know". Among those present a discussion in Arabic starts, heated but brief. Then all is silent. We stop to talk to the villagers. Some complain about the presence of refugees, who would steal fruit and vegetables from the gardens. "They have more rights than we have, living at home, but abandoned by our own country", we hear repeatedly. However, there have been no serious problems, and all public places show signs and writings in Arabic. We find out that, despite the widespread grumbling, many lend a hand, as far as possible, to the guests of the center. The alternative for asylum seekers is to reach Svilengrad, where everything is cheaper. Those with a tablet or a smart-phone can look for news and try to communicate with Syria using the free wi-fi at a few bars downtown. To get there, one must walk six kilometers forth and six back, or arrange for a taxi, which costs six lever (3 Euro), an expense not everyone can afford. "If you can", asks us through an improvised interpreter Doha, surrounded by her five or six children, "tell we need jackets, warm clothes. We came from Syria with only the clothes we were wearing. Here at night the air is already stiff. And soon winter will come". "For those arriving in Bulgaria fleeing conflict and repression, the main problems come from the ambiguity of the rules and the arbitrariness of their application". Lawyer Valeria Ilareva has been working in the field of refugee and migrant rights for ten years. She welcomes us in her small studio on the outskirts of Sofia between a legal consultation and the other. "Those who cross the border fleeing do so formally illegally. Under international law, however, sanctions cannot be applied to those who cross state borders while seeking protection, which must be guaranteed from the moment this desire is expressed", explains Ilareva. In Bulgaria, however, protection is actually ensured only when the asylum request is registered by the Agency for Refugees. There is then a period of vacuum, of totally unpredictable and unregulated duration, when asylum seekers (not yet registered as such) are subject to state repression. On Monday, September 9th, the Attorney General has even sent "reinforcements" to the regional attorney of Elhovo and Haskovo (the two areas near the border and thus most affected) to attend to the work more quickly. Trials for "illegal border crossing" were up 75% last year, largely as a consequence of increasingly massive arrivals of people fleeing from Syria. At the moment, the prosecutor in Elhovo only has set up 117. According to the Bulgarian Helsinki Committee (BHK), all are simply unfounded. According to Ilyana Savova, BHK program director for the legal defense of migrants and refugees, "trial of asylum seekers is against Bulgarian legislation, has no preventive effect, and has the sole purpose of artificially raising statistics on attorney effectiveness". Usually the first sentence goes on probation, in cases of repeated punishment it becomes effective. And those who arrived in Bulgaria to seek salvation end up behind bars. According to Ilareva, registration as an asylum seeker by the Agency for Refugees is a procedure that lacks in transparency and is completely arbitrary, without any definable temporal dimension. Also, in recent years some asylum seekers have been expelled while still longing for the registration (an act of duty) by the Agency. “Many of my clients ask me, how long? And I do not know what to say. Needless to say, totally arbitrary situations like this create the ideal conditions for corruption". "Here we are, waiting, waiting, but what for? ", told me heartbroken Yasser walking through the deserted streets of Svilengrad. "We fled from a country at war and without law, but here, where are the rules? If this continues, I'll try to go back to Turkey and then to Syria. At home there is the risk of dying in an instant, with a bullet in my head. But here I feel abandoned by everything and everyone, without hope, without rights. It's like dying little by little, day after day".